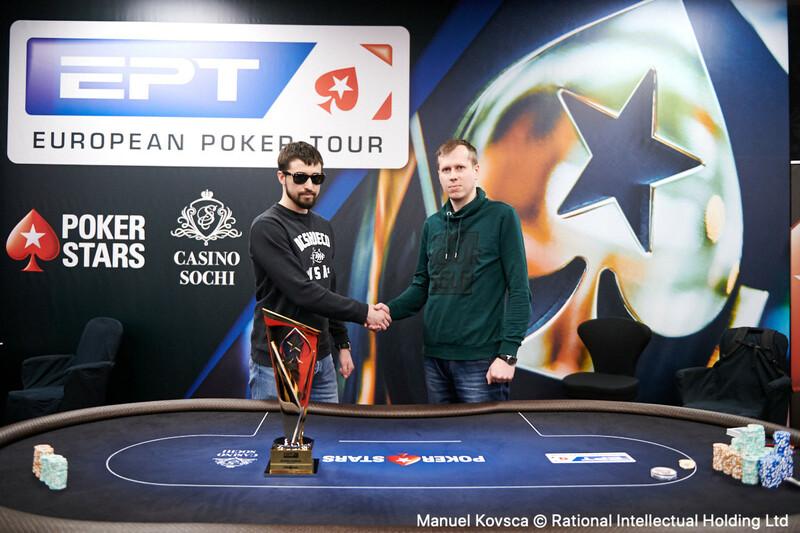 If Yury Masliankou's victory in the ₽77,000 EPT National Sochi was a boxing match, it was no first-round knockout, despite the Belarussian coming into the final day as chip leader and the favorite for the title. 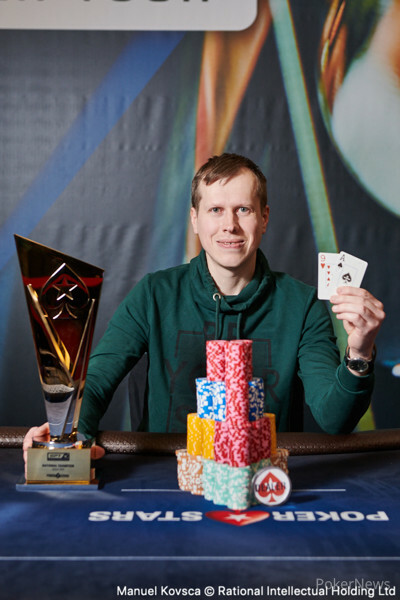 Instead, it was a tumultuous affair which saw two other players hold the chip lead at different points of the final table, before culminating in an arduous tussle heads-up against Daniil Lukin. Masliankou takes home ₽9,317,000 ($139,755), the biggest win of his career to date since a final table at Eureka Prague in 2016 netted him $96,025. He also becomes the second consecutive non-Russian to win this event after Matous Houzvicek triumphed twelve months ago. 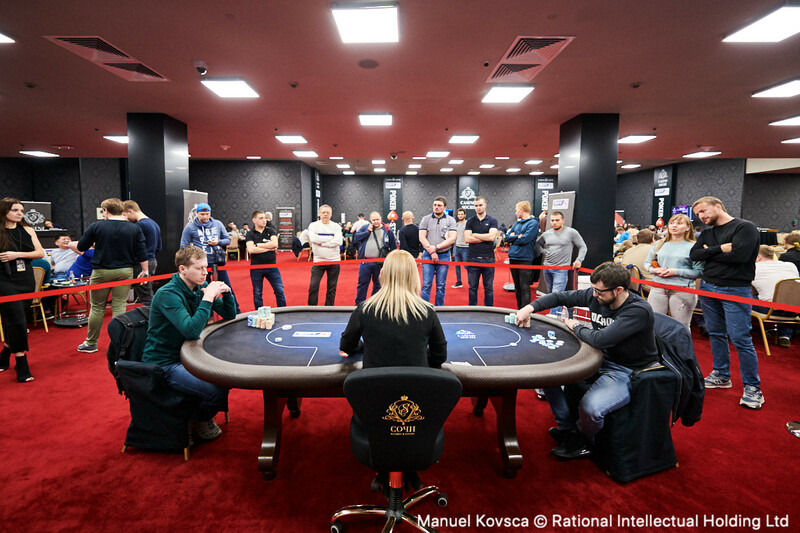 Runner-up Daniil Lukin started the day fourth in chips but was knocked down the standings with the early elimination of Sarkis Karabadzhakyan whose pocket sevens ran into the pocket kings of Alexandr Sergutin within the first level. Giorgiy Skhulukhiya had been active early and had chipped up enough to begin challenging Masliankou for the title of chip leader. Yesterday, Skhulukhiya had been involved in a raising war with Masliankou, and today showed it was no sole occurrence as he went to war with Sergutin. After opening from the button and four-betting a raise from Sergutin in the small blind, Skhulukhiya snap-called his opponent's five-bet jam with pocket queens. Sergutin's ace-king was behind, and as the flop and turn bricked, it wasn't looking good. But the king on the river allowed him to pull himself from the canvas and stay alive, doubling to over five million. Skhulukhiya (pictured above) traded double-ups with Leonid Bilokur before the former became the second elimination of the day. He got his last eight big blinds in against Lukin and failed to survive. Two swiftly became three when Day 1a chip leader Andrey Lukyanov ran ace-seven into the pocket tens of Sergutin and received no help on the board. 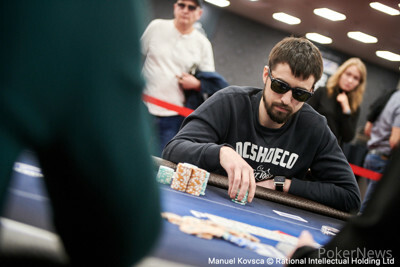 All this meant that by the first break start-of-day chip leader Masliankou and Sergutin were separated by just 5,000 chips at the top of the counts. Both Bilokur and Indian Kartik Ved had enjoyed quiet days, waiting for the optimum moment to get back into the contest. Ved thought he spied an opportunity against the aggressive Sergutin and shoved with just a pair of fours on a paired board. However, Sergutin held a pair of sixes and looked to press on further and dominate proceedings. However, Ved (pictured above) spiked a two-outer to river a full house and double up. 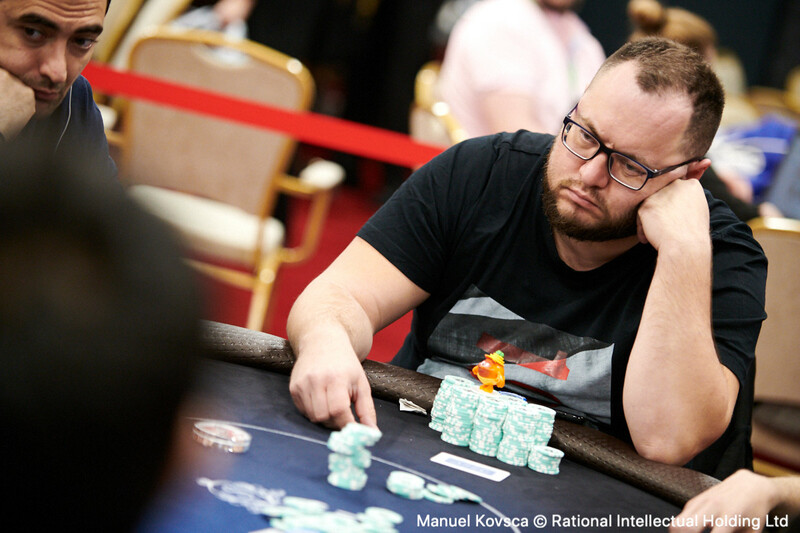 This miracle river seemed to spur on Masliankou more than anyone else, and perhaps sensing his chip lead under threat he moved quickly and eliminated Bilokur in fifth place to grow his chip stack once more. 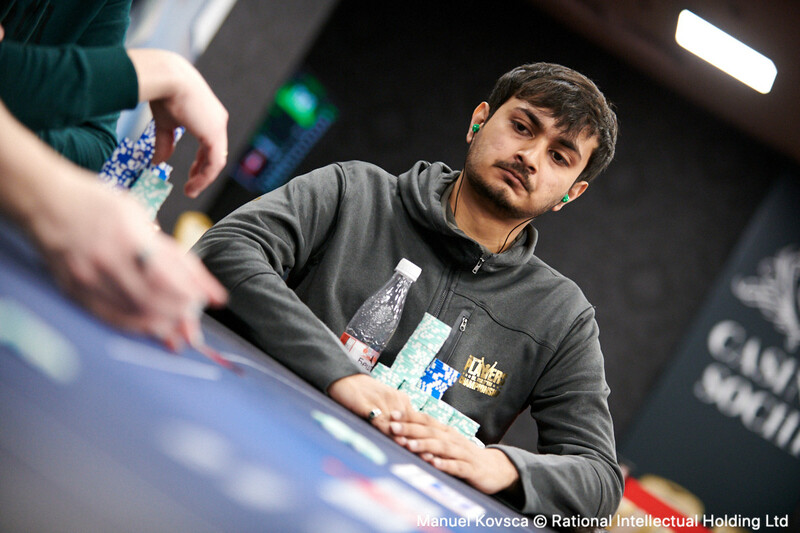 Having doubled up, Ved failed to make any proper inroads into Masliankou's chip lead and saw his stack dwindle until he limp-called a jam from Lukin in the big blind. Ved was ahead with ace-king, but Lukin's ace-ten suited turned a flush to send the Indian to the rail. Sergutin had seemingly taken a couple of rounds to recover from the Ved river hand but now seemed rejuvenated and once more was involved in what seemed a pivotal pot. He bet-jammed a king-high flop with top pair and a flush draw against Masliankou who called with just top pair. The turn gave Masliankou two pair, but Sergutin managed to find a better two pair on the river to move over nine million. But Masliankou had seen the whites of Sergutin's eyes and now was out for blood. 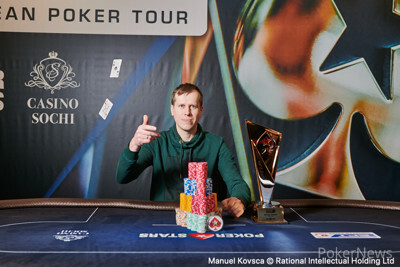 First, Masliankou returned to the top of the chip counts after calling Sergutin's river bluff with a rivered straight, and next, he finished him off. Getting it in behind with just a pair and a straight draw against Sergutin's set, he rivered a second straight to eliminate Sergutin and take a healthy chip lead into heads-up. There was a balanced start to heads-up play, with both players winning small pots off one another. But as the contest drew on, it almost appeared that Lukin was using Muhammad Ali's famous rope-a-dope strategy; absorbing blows and letting his opponent fatigue themselves. That certainly seemed to be the case as Lukin prioritised staying alive as opposed to making any serious dent in Masliankou's chip lead. He seemed to content to sit with a stack of six to seven million compared to his opponent's 14-15 million and wait for his opening. However, it was Masliankou who had his opponent down for the count first. Getting it in on a five-six-eight flop, Masliankou had flopped a straight against the seven-eight of Lukin. You could almost picture the referee counting Lukin out as the turn bricked, but the river gave both players a straight and they chopped it up. A let-off but as it turned out a short one. Much like a boxer Masliankou, pushed forward insert of a killer blow. Suddenly, Lukin's chip stack shrunk from thirty big blinds at the time of the chop, to just twenty. Sergutin's legs had gone from underneath him and when Masliankou shoved, he sounded almost relieved to get his last 15 big blinds in. He was behind, he failed to improve, and Masliankou won by knockout. 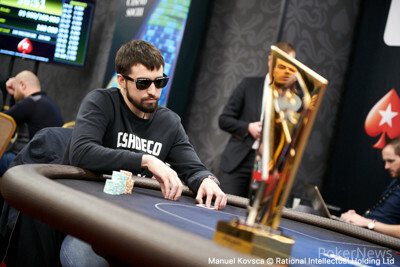 Yury Masliankou moved all in and Daniil Lukin quickly announced call for his last 3,500,000. The flop came giving Lukin the lead and perhaps a way back into the contest. The turn was the giving Masliankou top pair, however, and restricting Lukin's outs because of his flush draw. Masliankou's rail celebrated as the hit the river and Masliankou's victory was confirmed. Lukin takes home RUB 5,705,000 ($85,575) for his runner-up finish. Two hands in a row Daniil Lukin has either shoved or shoved over a limp from opponent Yury Masliankou. Both times Masliankou has asked for a count but folded. It is starting to feel like a matter of when not if the pair get it in again. There haven't been many big pots, but with the blinds now at 125,000/250,000 any pot that goes further than the flop is going to score some serious damage to either stack. In this hand Yury Masliankou opened and Daniil Lukin called. Lukin check-called 500,000 on the flop but check-folded to a bet of 1,500,000 on the turn. Yury Masliankou had been bossing things after resuming from the break and the tournament has just glimpsed a potential end to this stalemate. On a flop Masliankou checked to opponent Daniil Lukin who bet 250,000. Masliankou check-raised to 750,000 and Lukin shoved. Masliankou didn't think long before calling. Masliankou had flopped the nut straight against the pair and straight draw of Lukin. The turn was the but the river meant the pair chopped the hand and heads-up play continued. 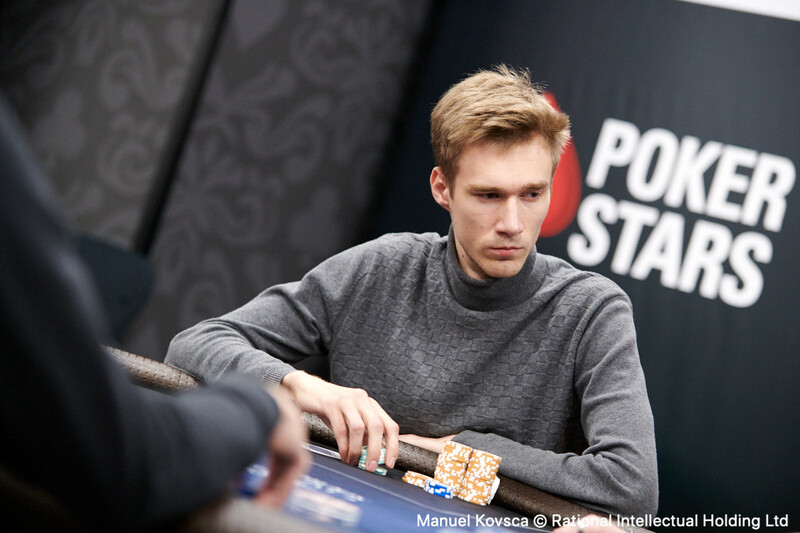 On a flop Daniil Lukin check-raised a continuation bet from Yury Masliankou to 1,000,000 and Masliankou called. The turn was checked by both players. The river was the . Lukin moved all in and Masliankou quickly folded. Lukin showed for a pair of threes and Masliankou nodded. The players are now going on a 20-minute break. 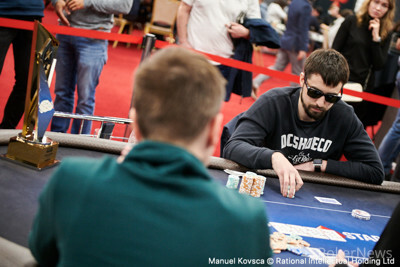 Both players limped and Yury Masliankou check-called 200,000 on the flop from Daniil Lukin. The turn was the and Masliankou check-called 500,000. The river was the . Masliankou checked and Lukin bet 700,000. Masliankou called and was shown for a rivered flush and Lukin returned to between six and seven million where he has been for most of the heads-up match so far. 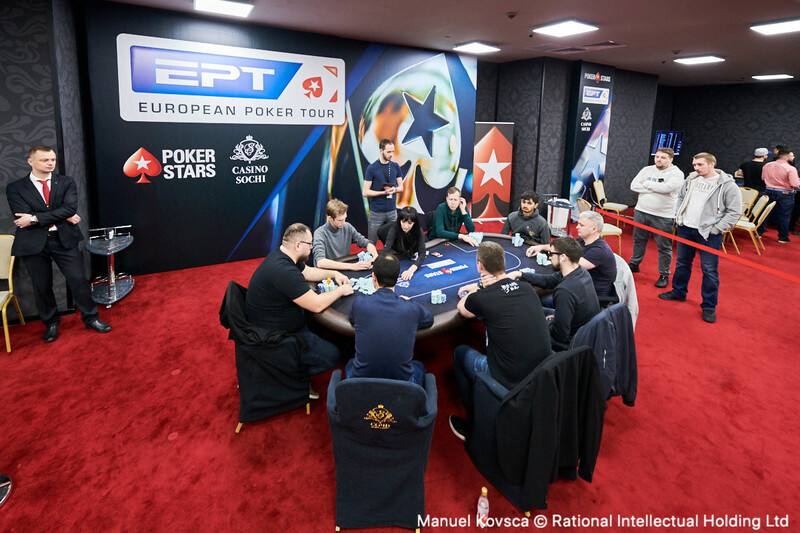 Eight Remain, But Who Will Win EPT National?